8pm The Winachi Tribe – The Electro funk pioneers recently returned from a tour of the West Coast of the United States and also shared a stage with Slydigs at Parr Hall to celebrate the fifth anniversary of live platform Warrington Music [WAM]. They released a new track and video this week called Transition and will be starting their UK tour, right in their home town. 7pm Sly Antics – Sly Antics, featuring former Lymm High School pupil Chris Allen, recorded their debut EP, Captive City, at Greenmount Studios last year. They have been tipped for great things and have been supported by the likes of BBC Introducing and Louder Than War magazine. 6.30pm Psyblings – Festival regulars Psyblings merge gritty blues, psychedelic rock and punk. Their diverse influences include Ty Segall, King Gizzard and the Lizard Wizard, Jimi Hendrix and Nirvana. 6pm The Ambersons – Warrington live favourites who recently reformed offer a big slab of 60s rock and roll and classic Manchester with a side order of Memphis. As previous headliners of the Festival, they will be looking forward to returning to the Old Market Place Stage. 5.30pm The Zangwills – The Zangwills formed just a year ago after Jake Vickers, Ed Dowling and Sam Davies met at sixth form college in Northwich. The line-up was completed by drummer Adam Spence from Chester. They are fast making a name for themselves with their debut single, New Heights, being played more than 25,000 times on Spotify. 5pm Kula Bay – Formed in Birchwood in June 2017, indie pop four-piece Kula Bay have already had extensive support from BBC Introducing including acoustic sessions and interviews. 4.30pm Floral Scene – Formed in 2016, the summery indie band recently headlined Manchester’s Night and Day Cafe. For fans of Two Door Cinema Club, Bombay Bicycle Club and Viola Beach. 4pm Tall Children – Tall Children is actually one man: Ben Hughes. Ben picked up a guitar, aged five, and by 13, he was being taught by legends Tommy Emmanuel and Martin Taylor. Find out more about Ben’s solo project here. 3.30pm Hanover – A four-piece synth-pop band from Liverpool influenced by 80s music. The band released their first music in 2016 and have gone on to earn plays on BBC Radio One. 3pm Serratone – Think Royal Blood mixed with Red Hot Chili Peppers and Slaves. Serratone are a hard rock powerhouse from Newton who have been playing shows since they were 10. At the festival they will be showcasing their latest single, Sweet Disease. 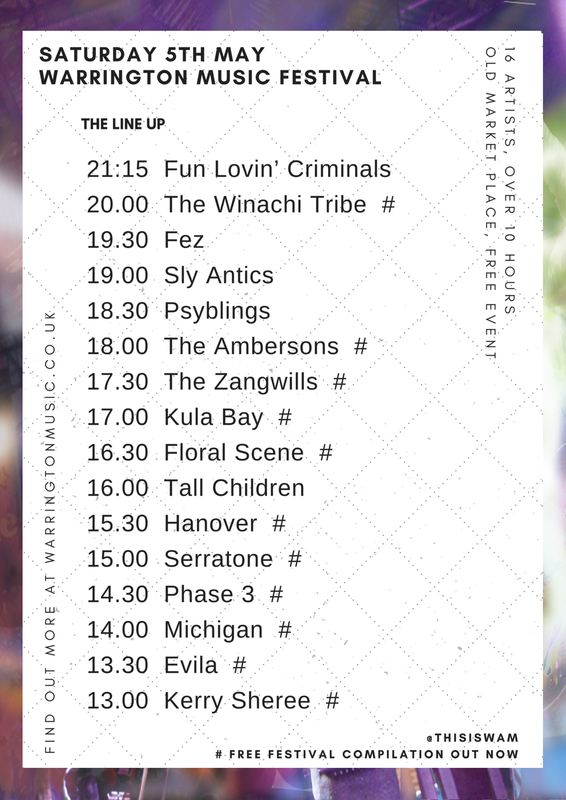 2.30pm Phase 3 – A force of nature with punk riffs mixed with poetic lyrics, Phase 3 are unlike anything else on the bill. 2pm Michigan – Confidently blending blues riffs and big indie rock choruses, the Warrington band formed in 2015. The band release their brand new single ‘Shimmer’ this Friday. 1.30pm Evila – A 31-year-old rapper, singer and producer from Warrington who has been actively creating his own brand of hip-hop since he was 11. Previously of Festival favourites, Lazyfader, he has just released his third album, The Phoenix Amongst Vultures. 1pm Kerry Sheree – The Gorse Covert singer recently recorded her song, Eptir, at Parr Street Studios in Liverpool and now has plans to release a full album. To be found playing across the town weekly.